The Ice Age is the popular term given to the so-called Pleistocene epoch, the last of the supposed geological ages of earth history as formulated in the minds of modern historical geologists. It was immediately prior to the Recent Age in which man has left written records. Most anthropologists believe man reached the true human stage of evolution early in this glacial period, after a long process of naturalistic development from an unknown ape-like ancestor starting about 30-60 million years ago. The Ice Age is believed by evolutionists to have started about two million years ago and terminated about 11,000 years ago. Most creationists, on the other hand, believe the Ice Age began soon after the Flood and continued for less than a millennium. During this period, a great continental sheet of ice, centred somewhere in the north-east Canada-Greenland region, swept down over North America, reaching into what are now the States of Wisconsin, New York. etc., and leaving effects in the form of great moraines (mounds of unsorted sand. gravel and boulders), scratches and grooves on bedrock, etc. A similar ice sheet swept over northern Europe. In the Rockies and other mountain chains, permanent ice caps rested on the summits and extensive valley glaciers descended almost to the plains below. Most evolutionary geologists believe that the Ice Age involved at least three advances and retreats of the ice, with warm periods in between. However, the evidences for the earlier advances are of an entirely different sort than the moraines and striations of the last one, the so-called Wisconsin stage. The former consist of certain dense clay soils, old river terraces and other phenomena that can be interpreted as water-laid formations more easily than they can as earlier glaciations. It should also be noted that the ice never covered the entire earth. Some Bible teachers have mistakenly equated the glacial period with an imagined world-wide cataclysm which left the earth ‘without form and void’ (Genesis 1:2) and covered with water, but this interpretation is impossible. The ice never covered more than a third of the earth’s surface, even at its greatest suggested extent. As a matter of fact, there was probably a ‘pluvial period’—a period of much rain —in the lower latitudes at the same time as there was a ‘glacial period’ in the upper latitudes. Extensive rainfall assured abundant water, even m such modern deserts as those of the Sahara, the Gobi, the Arabian, and the western basins in the modern United States. Archaeological excavations have yielded abundant evidences of human life and, in fact, complex irrigation economies in these now-desolate regions. There is abundant evidence of human occupation in these lower latitudes throughout the entire Ice Age. Many evolutionists are now dating the earliest fossils of what they consider true men as in the Pliocene epoch even before the Ice Age. The Neanderthal peoples seem to have lived near the edge of the ice sheet in Europe, and many anthropologists now believe that their somewhat brutish appearance was due to disease (rickets, arthritis) contracted because of the cold, damp and poorly sunlit climates characteristic of such regions. There is no reason (apart from highly questionable dating methods) why these peripheral cultures could not have been contemporaneous with the advanced civilizations of Egypt, Babylonia, and others that were developing in the lower latitudes. The Ice Age can easily be understood as lasting several hundred years rather than two million years. Evolutionary glacial geologists have been debating for nearly a hundred years as to what may have caused such an Ice Age, without coming to any consensus. The rocks which supposedly correspond to earlier ages practically all give evidence of a worldwide subtropical climate, and the cause of this condition is also a mystery. What evolutionary and uniformitarian theory finds inexplicable, however, the biblical record explains quite satisfactorily. Before the great Flood, the world had pleasant topography and climate everywhere, the latter probably involving the ‘greenhouse effect’ produced by a vast thermal blanket of invisible water vapour (the ‘waters above the firmament’ noted in Genesis 1:6). There were no rain-storms, no volcanic eruptions, no earth-quakes, no blizzards or physical disturbances of any kind—the world had been prepared to be ‘very good’ (Genesis l:31) as a home for man and the animals. With the Flood, however, all this changed. The vapour canopy condensed and fell to the ground in violent torrents for five long months, and waters and magmas burst forth all over the earth through ‘the fountains of the great deep’ (Genesis 7:11; 8:2) for the same period. Tremendous earth movements accompanied and followed the Flood, and catastrophic phenomena of all kinds continued on a lesser scale after the Flood. In particular, the precipitation of the vapour blanket at the outset of the Flood gradually dissipated the greenhouse effect, and the Arctic and Antarctic zones grew bitterly cold. During and immediately after the Flood the tremendous heat energy released from the depths continued to evaporate great quantities of water, much of which was transported to the polar regions by the newly developing post-Flood atmospheric circulation, where it fell as great quantities of snow. Soon the accumulating snow pack became an ice sheet, radiating out from its centre. There seem to be certain references to this Ice Age in the ancient book of Job (37:9-10; 38:22-23; 38:29-30), who perhaps lived in its waning years. The lands had been denuded of their plants by the Flood, and the air of its carbon dioxide. Gradually, however, the seeds and twigs from the antediluvian plants rooted and grew again and the biota began again to emit carbon dioxide into the atmosphere. Great peat bogs developed along the ice sheet margins, and peat bog vegetation is known to be especially effective in supplying large amounts of carbon dioxide to the atmosphere. Eventually enough of this gas built up in the atmosphere to restore a partial greenhouse effect and the temperatures rose sufficiently to cause the ice to retract to its present-day position. During the centuries of the Ice Age, many of the great animals that had come off the Ark, though they survived and proliferated for a time, eventually were unable to cope with the drastic changes in climate and environment and became extinct. As the ice later retreated and the rainfall patterns changed, many of the pluviated regions became arid and still other animals died out. The great cataclysm of the Flood, followed by the smaller related catastrophes of glaciation, volcanism, and eventual desiccation, drastically changed the character of the earth and its inhabitants. 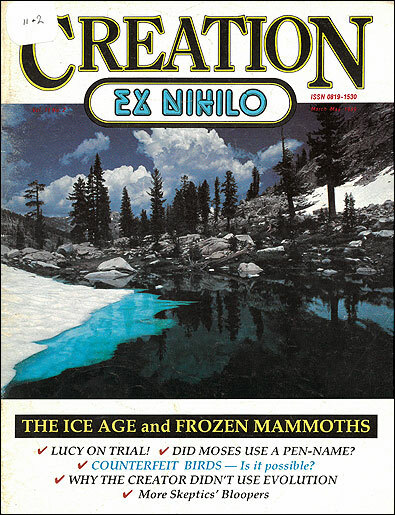 Most creationists believe the Ice Age began soon after the Flood and continued for less than a millennium. During this time, a great continental sheet of ice, centred somewhere in the northeast Canada-Greenland region, swept down into North America (reaching what is now Wisconsin, New York, etc.). A similar ice sheet swept over northern Europe.